a Unesco World Heritage site. Queensland Australia. 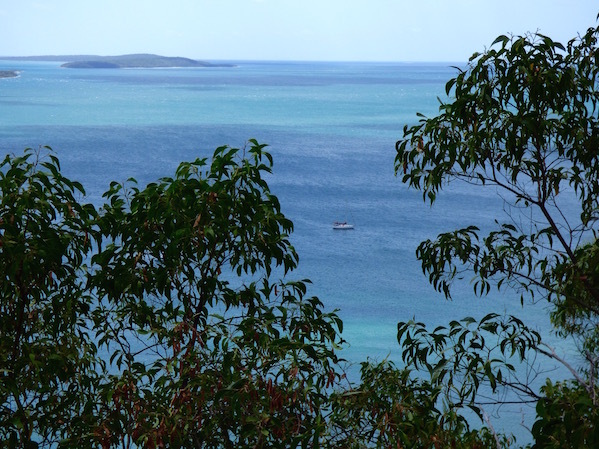 We’d heard Kingfisher Lodge offered the most to do of all the anchorages on Fraser Island. The day before, I blitzed Fraser Island on a guided tour, while my better half, Wayne, and our solo-sailor friend Eve of Auntie had yet to set foot on Fraser. We headed toward shore on our dinghy to check it out. 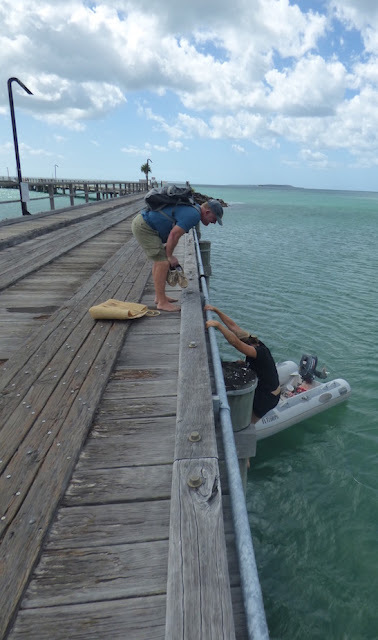 The previous day, Chris and Chris of Scintilla and I found ourselves first dragging their dinghy for quite a ways up to get past the high tide line before heading out for the full-day Fraser island tour. When we returned. the low tide required dragging their dinghy an even longer ways back, plus a long wade and rowing a bit before the water was deep enough to drop the outboard motor to propel us back to our boats. That prompted Wayne to try a different strategy for to deal with the big tidal swings and Fraser’s exceedingly shallow shelf to shore and securing our dinghy while we explored ashore. Wayne tied our dinghy to a post on Kingfisher Lodge’s long pier near the waterline. The theory was we wouldn’t find ourselves having to make a long drag back to the water when we returned. Overlooking the anchorage area and beyond from a viewpoint off a Kingfisher Lodge trail, Fraser Island, Queensland Australia. Turns out the tucker tour was more of a lecture, and never went past the Lodge parking lot. There was a $20 tucker tasting that Eve and Wayne figured would be more worthwhile – for me, as I didn’t shy away from taking a bite of a Bardi grub. Eve and Wayne were less adventurous eaters. After the bush tucker tour, we decided to check out the nearby trails. We weren’t up for tackling the 11 km trail – each way -- to Lake McKenzie. It was already mid-afternoon and the trails were loose sand and I wasn’t sure if they overlapped with the tour busses and definitely didn’t want to compete for space or get dusted by them. 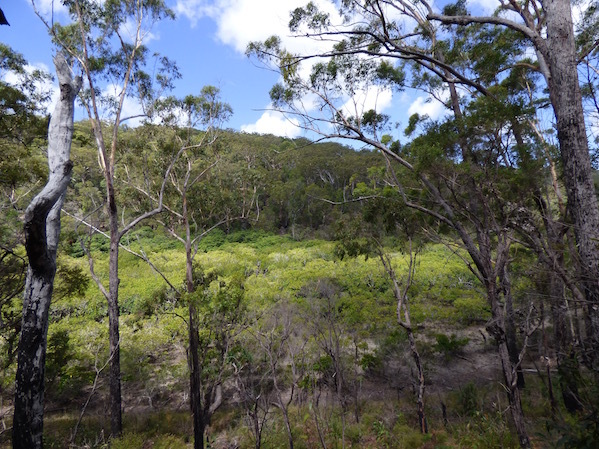 Between the gum trees (eucalypts), shrubs and mangroves formed an intricate and dense tapestry of greens. Hiking ,Fraser Island. Instead, we took a loop trail that led to an overlook, then down past the mangroves and back along the shoreline. The clear afternoon made for not only a nice view of our anchorage, but also of the islands we passed on our way in to Fraser. 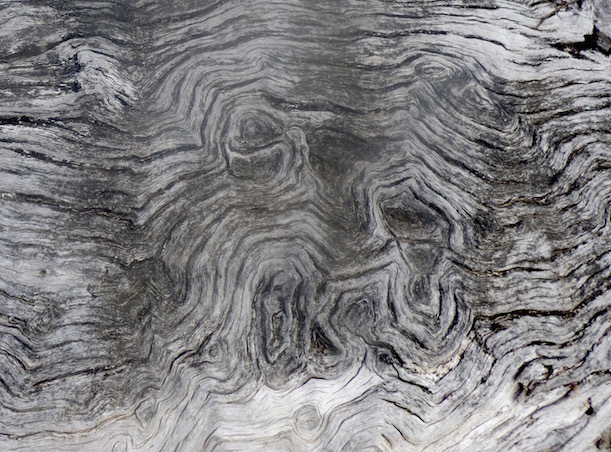 Naturally sculpted driftwood on Fraser Island's shoreline, between the mangroves and Kingfisher Lodge pier. We opted for #1, to try the path forward, hugging the shoreline. If you visit Fraser and decide to hike the same trail we did, consider the shoreline portion as a LOW TIDE OPTION ONLY! We puzzled over why the trail wasn’t labeled as such on Kingfisher’s info. Then, to our dismay, the pier the dinghy was tied to was now in at least waist deep water. Then Eve offered up a fourth option, to scale down the pole our dinghy was tied to from the pier above it. We decided if she was game, we’d take her up on it. It wasn’t easy, but she pulled it off! 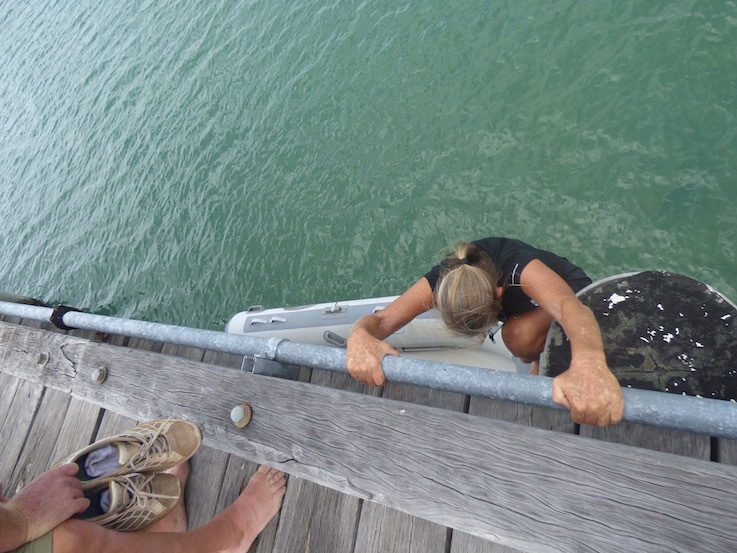 Eve, beginning her decent to our dinghy, tied off a ways down, below Kingfisher Lodge's pier. Fraser Island, Queensland, Australia. Still a way more to forEve to rappel down.... Wayne offers encouragement. 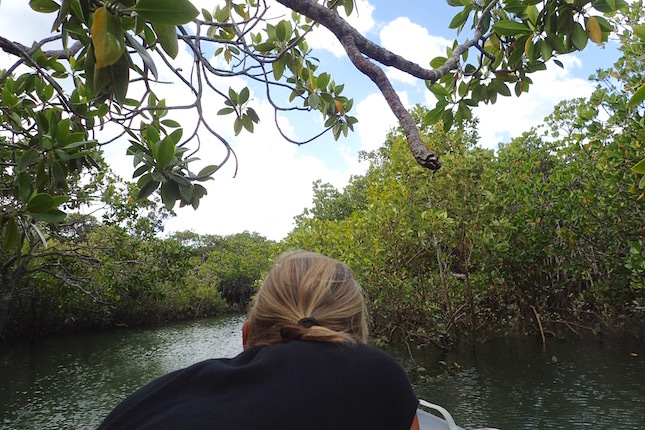 Given how high the tide was, the timing was perfect for a dinghy ride up the inlet into the mangrove. We trailed a ranger-led group kayakers headed into the mangroves before us. We knew we wouldn’t run aground before the kayakers reversed course. The waters weren’t as clear as other mangroves I’ve explored by kayak, but we were all still enthralled by its mysterious beauty. Eve ducking as we wove our way through Fraser Island's mangroves at high tide, near Kingfisher Lodge. We ducked and twisted our way upstream, eventually hanging a u-turn as the kayakers began their trek back. Near the exit, a hop—hop-hop ZING bee-lined the waters right in front of us, startling us into momentary silence.“That’s classic predator and prey in action,” Wayne laconically observed. 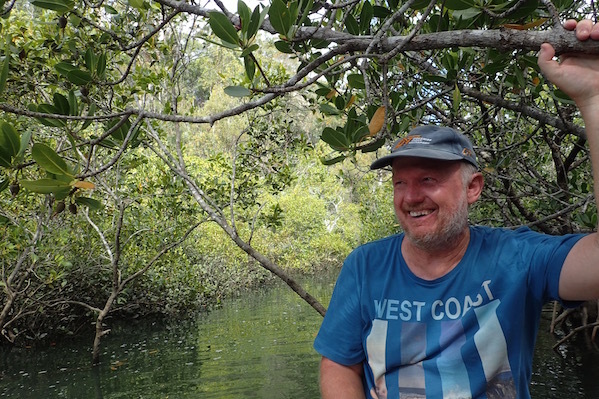 Wayne, laughing as he holds onto the mangrove branches we're trying to avoid getting thwacked by in our dinghy tour. Feeling satisfied we’d had a full Fraser Island afternoon, we returned to our respective boats, to rest up for whatever the next day had to offer. PS Afterward, we spotted a lower dock at the end Kingfisher's pier with an area that looked like it wouldn't be in the way of the ferry that brings visitors to Fraser from the mainland. After dodging several fishing lines, we tied off there. Our dinghy was moved but safely re-tied while we were ashore; we're guessing it got in the way of a catch. Still beat rappelling, or swimming to the dinghy, or dragging it a half-mile to get to outboard-able waters. 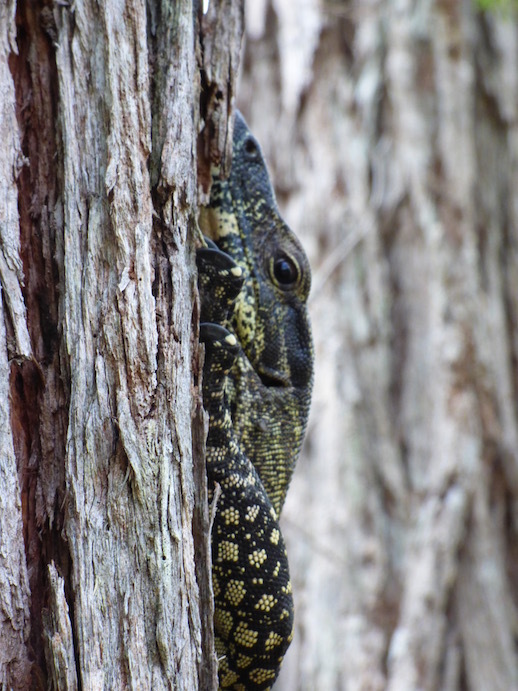 We toured Fraser Island (S25.22.852 E153.01820, near Kingfisher Lodge), November 19-24, 2016. We are currently anchored off Brisbane's area's Peel Island, Horseshoe anchorage (S27.30.265 E153.21.640). 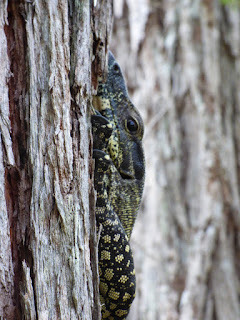 There is still one more post from Fraser Island coming (and eventually a short video clip) as well as a few final catch-up posts from New Caledonia. Our next stop is Gold Coast, Southern Queensland. From there it's about a 350 mile, multi-day passage to Pittwater, near Sydney. Our goal is to be aboard our boat in Sydney Harbor, taking in the New Year's Eve festivities.